Bear witness at the trial. 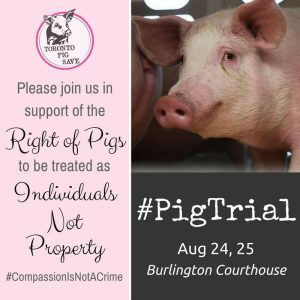 Tomorrow is the day that Anita Kranjc goes on trial in Burlington, Ontario, Canada for giving water to pigs on a sweltering day in June, 2015, “traveling companions” in a truck bound for slaughter (euphemism for murder) at Fearman’s Pork Inc. There has been a lot of attention since this case hit the news, both on social and in mainstream media, the latter being a very, very good sign indeed. You see, vegans and AR activists understand that the sharing of and commenting on this news outside of inner circle social media is key to unlocking the door to a wave of much needed support for the cause of other species emancipation. We fist pump, do a little dance and experience a collective sigh of relief when cases like this hit our local and national newspapers and make the grade on major TV channels. Anita even has made the annals of Wikipedia, which means, in my view, that many people are looking for info and clarification. The “Best Video You Will Ever See” quote states that Anita faces a six month jail sentence if convicted. I have heard other possible penalties bandied about, so I decided to do a little investigating of the mischief laws here in Canada. (d) obstructs, interrupts or interferes with any person in the lawful use, enjoyment or operation of property. (b) is guilty of an offence punishable on summary conviction (maximum 6 months’ jail and/or $5,000 fine). 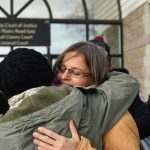 Initially, Anita was charged with criminal mischief, an indictable offence which is described as the interference with the use, enjoyment and operation of property and which carries a maximum penalty of 10 years. In pre-trial, the judge elected to proceed by summary conviction on the charge of criminal mischief over $5000, which carries a maximum sentence of six months in jail and/or a $5000.00 fine. It is my understanding that the issue here as regards the law is that pigs (and other farmed animals for that matter) are regarded as being the property of the farmer, in this case Eric van Boekel. In offering water to these pigs, Anita violated a law which prohibits interfering in any way with the goods of another. 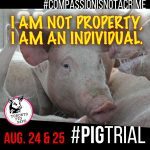 It’s wrong to see pigs as property, just as it was wrong hundreds of years ago to see human slaves as property and women as chattel — the property of men. The law needs changing. The case against me will hinge on The Golden Rule. Compassion is not a crime. Anita’s defense will present the Golden Rule. As I understand it, it will be argued that giving the pigs water is an act of compassion and therefore falls under the rubric of a moral and ethical obligation to lend assistance when suffering is present. As such, the law which prohibits interference with another person’s property does not apply and therefore is neither indictable nor punishable under said law. And herein lies the rub. 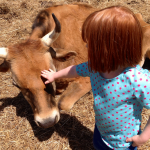 The law considering farmed animals as property and chattel needs changing – YESTERDAY! What essentially is legal and sanctioned use, abuse and exploitation of other species in Canada garners our country the reputation of and classification as being one of the biggest offenders of other species rights, as evidenced in our antiquated anti cruelty and farmed animal transportation laws. But, it is the law!!! Overall, Canada gets a D rating on the animal protection index, which rates 50 countries on a scale of A to G on the strength of their policy and legislative commitments to animal welfare and protection. I do not know what is going to happen tomorrow on the 24th when this case goes to trial. I do not understand law well enough to know if the judge can bring down a favorable decision which operates outside of the parameters of this specific law. Even if a guilty verdict is returned, will Anita receive the maximum penalty under the law and/or a fine, which she has said she will not pay, or a slap on the wrist for a first time offence? I presume, that regardless of the outcome, this case will open the door to re-visiting our archaic welfare laws, a perhaps necessary step in leading to the overdue emancipation of all species trapped in our various death for profit industries. 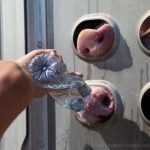 Liberation of all species is the end goal for Toronto Pig Save and all vegans and AR Activists who understand that it is not how we use these beings, but that we use them at all. Anita asks people to become vegan, to bear witness and to participate in non violent direct action. Bearing witness for Toronto Pig, Chicken and Cow Saves takes the form of weekly vigils outside slaughterhouses, with a view to raising awareness of the plight of these sentient beings specifically, and all species in general. Bolstering a growing community which knows implicitly that it is unnecessary for humans to use all other animal species for any purpose, drives home the truth that veganism is the moral baseline and the very least we can do. I stand with Anita during this trial and always. Kudos to Anita for her bravery, which she characterizes as her duty. 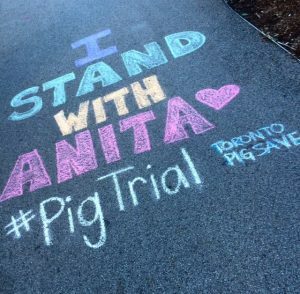 Kudos to all the people at Toronto Pig, Cow and Chicken Saves who lend their conviction, truth, time and effort to the only social justice movement in history where the victims cannot advocate for themselves. Kudos to all those who understand that emancipation is the goal and that veganism is the way. . Thanks for the support-always appreciated! 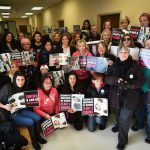 Thanks for another well written and informative article on Anita Kranjc’s plight and fight for justice for the animals at Toronto pig save and indeed all animals that humans use for their own wants not needs. It sounds to me from the laws you have described on what constitutes “criminal mischief” and its punishments under current Canada law that hopefully she will get off with just a “slap on the wrist” as you say. If her defense can argue that her actions were motivated by the “Golden Rule” and that it was because of compassion that she “interfered with property” under moral and ethical obligations then I think she has a very good chance of getting off if it is her first offence. I think there is a massive positive in all this, in that it has opened the door to further discussion on Animal Welfare Laws in Canada which sounds like are well overdue revisiting as they are in most countries, sadly. The awareness and media coverage of this both in mainstream media and social media can only be a good thing and help the animals plight and help to change people’s attitudes about enslaving species and treating them as “property” as described in the above legislation you have described in 430(1) c and d.
If the judge decides to give her six months which I sincerely hope he/she doesn’t I think there will be an outcry from AR activists and it will create further media attention and awareness. I will be following this trial over the next few days and hope and pray that Anita gets the best outcome possible. Thanks for all you do Anne. I always look forward to reading your beautifully written and well researched articles. Thank you for your considered thoughts. We shall soon see how this all pans out. 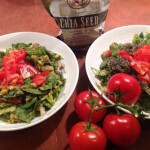 Emancipation is the goal and veganism is the way! Thank you for your enlightening article. I hadn’t heard of this trial. Like you, I stand with Anita. She did what anyone with a heart or conscience would for a living being. She is to be commended, not prosecuted. I am glad that my article resonated with you. There are many activists gathering outside the courthouse as we speak. This trial is bound to created some positive change. I am with Anita too!! Well said Anne! Thank you for this most enlightening article and point of view. For my part, I find it incredible and mind blowing that someone, an activist, should be going to trial for her kindness , humanity and compassion towards pigs who had a lifetime (they are essentially babies of maybe 6 months) of misery and who will suffer the very last indignity of being transported and then killed in such a cruel way ( there is no kind way to do live transport or slaughter animals) so people can enjoy their meat. Even more so mind boggling is the fact that we’re a country that sometimes lets murderers off the hook. To my mind comes the Guy Turcotte case not 2 years ago, where a man killed both of his children and got away with it until petitions and public outrage forced the justice system to re-try the man. To me that also said a lot about the ones who can’t defend themselves versus the ones who have access to good lawyers, government subsidies (our taxes) and money. In this case a wealthy company, that is also subsidized by our governments, and that wishes to make an exemple of Anita and hoping to deter anyone else. The punishment certainly doesn’t fit the crime, as there was essentially no crime to speak of. What it is, is a witch hunt brought on by a scared industry. That also means that people are eating a bit less meat, and the industry is getting mervous about the vegan movement! I will look for information online and look forward to any updates you might have. i am very glad that you enjoyed this article and am over the moon that there is so much mainstream media attention being paid to this trial. Two days in and the world is already learning more about the atrocities within these abhorrent industries. 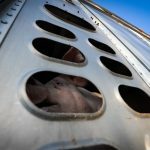 The defense’s line of questioning has required the pig farmer, Van Boekel to answer tough questions about the nature of his operation and the cruel treatment of the pigs as commodities. The driver did not fare very well under scrutiny and this serves, in my view, to bolster the defense’s case. i agree with you about Guy Turcotte. Now, we need to extend the same kind of respect and dignity to the babies, mothers and families trapped in all of our various death for profit industries. There are too few heroes in this world. Anita Kranjc is one of them. There are those who can’t pass by another, even if it’s not one of “our own” and watch them suffer without helping…even when we realize that the help we give isn’t going to prevent an even worse outcome… There are fewer even still who will give that aid – knowing that the worse will still come – and risk or even go to prison for the simple act of kindness…. more words don’t come to me right now. Thank you for this post. I hope it gets picked up by more and more media sources..I will be thinking of Anita and holding her close in my thoughts here in Germany. Eek, I remember reading this post, but forgot to comment. Anyway, absolutely, the amount of media attention garnered by this trial was fantastic. I believe future court dates will be on Oct. 3 in Burlington (less than a week! ), Nov. 1 in Milton, and Nov. 10 in Burlington. Let’s hope the momentum of support and attention continues!